If there’s one thing about the 2019 Porsche 911 GT3 RS that is super-cool, it is the engine. Where else can you find a naturally aspirated 4.0-liter flat six that’s good for half-a-grand of horsepower and 346 pounds-feet of torque? Compared to the 2018 model, the powerplant cranks out a full 20-horsepower more than the current model. The powerplant is the most-powerful naturally aspirated engine that Porsche has stuffed in the rear of a 911. Imagine what a racer might do with this type of power: 0 to 60 acceleration – 3.0 seconds, two-tenths quicker than the 2018 model. Taking that type of business to the street is a retuned, seven-speed PDK shifter. The top end is just short of 200 mph at 193. Overall downforce is up. Porsche is using a larger lip on the front spoiler, more massive side skirts, and a reworked rear diffuser. Indeed, at 124 mph, according to the automaker, the GT3 RS puts twice the downforce to the overall platform. The 2019 will boast standard 20-inch wheels and tires. To help increase performance, buyers can choose a set of forged magnesium wheels that are 25 pounds lighter than the standard rubber/wheel combo. It’s not a cheap option at $13,000, but when you are laying out the better part of $200,000 for a 911 GT3 RS, it’s a drop in the bucket. While you are in a weight-saving mood, you can choose the Weissach Package – only $18,000 – which drops another 13 pounds. The package uses a carbon fiber roof, front and rear sway bars, coupling rods, steering wheel trim and shifter paddles. With the package and wheels installed the GT3 RS weighs 3,153 pounds. The GT3 RS features recalibrated rear steering and Porsche Torque Vectoring Plus for better cornering. And, the bucket seats use carbon-fiber-reinforced backrests to help keep the front driver and passenger planted in turns and corners. The GT3 RS also uses a new set of helper springs on the front and rear axles to keep things better planted. Keeping the brakes cool Porsche uses a set of NACA ducts, borrowed from the 911 GT2. The automaker helped to keep the weight down by using a magnesium roof, polyurethane front and rear fascias, a carbon trunk lid and fenders, titanium muffler and exhaust tips, lightweight glass, and other features. Porsche also opted to use less sound insulation throughout the vehicle. 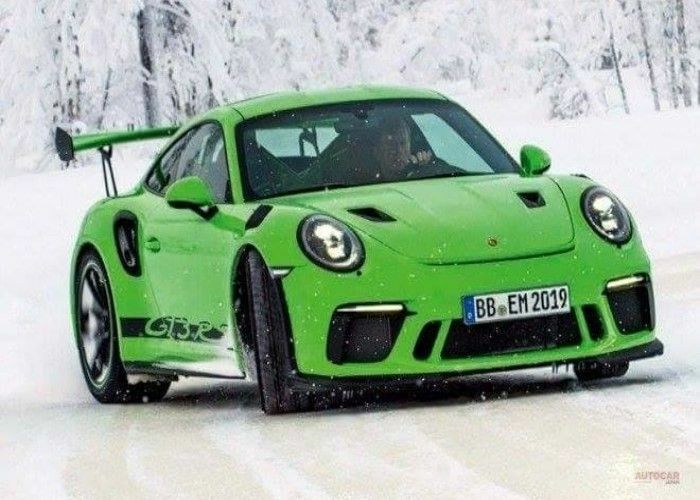 The GT3 RS debuts next month at the Geneva Motor Show in Switzerland.